Why use Treestation's woodfuels (firewood and woodchip)? We offer locally produced firewood from sustainably sourced local timber, at affordable prices. Everything we do is driven by our ethics, from our day-to-day operations to our choice of bank and energy provider. By buying TreeStation products, either directly or through our Greater Manchester network of retail outlets, you are supporting a local and genuinely ethical project. We trust that the following reasons, combined with the testimonials of satisfied customers, will encourage you to choose the TreeStation as your supplier. Our carefully selected feedstock is handled by our skilled and trained staff, using only well-maintained and fit-for-purpose specialist equipment. This, combined with our strict policies, appropriate seasoning duration, and meticulous production process, ensures the consistent high quality of our products. Our supervisory staff have been trained on the Ignite accredited course “Woodfuel production and supply”. Our biomass chip is Woodsure Plus accredited, for an independent guarantee of quality, sustainability and traceability. We also have a strict policy of not allowing waste wood or non-virgin wood on our site, to avoid any contamination. If you are a new customer, please have a look at our customers’ testimonials for the assurance of a high grade product. Whilst we primarily use arisings from treework as feedstock; we have established links with the Forestry Commission, Local Authorities and other land owners to ensure security of supply when arisings availability is not sufficient. Thanks to our unique integration of treework contracting, woodland management, arisings handling, products manufacture and supply; we are less dependent on external factors and agents to set our supply and costs. You can rely on us to heat your home during long winters and unexpected cold snaps. Because we are a not-for-profit organisation and we use our own resources to undertake treework contracting, timber extraction and haulage, firewood production and supply, we are able to offer competitive prices. We are strongly committed to our ethical values. They are the reason we are in business, and we stick to them in day-to-day practice. We are a not-for-profit co-operative (BenCom), and believe we can make a difference to the local community and global environment by successfully running the TreeStation. We offer bespoke solutions to meet the needs of our customers, in terms of products specifications, delivery options and contract types/durations. We also offer rapid response and personalised advice. Our skilled and reliable team works to high professional standards, and undertakes each stage of our process with our customers’ satisfaction in mind. We are approachable and happy to discuss any concern, question or comment you may have. As a Society for the Benefit of the Community, the Treestation is owned and controlled by its members, most of which are also customers, so it’s fair to say that our focus on customer service literally goes to the very heart of the business. We have systems in place to ensure that concerns or complaints are dealt with honestly and quickly, and that positive feedback can be passed on to those who have generated it. We strive for customer service excellence at all times. The environmental, social and economic issues associated with fossil fuel dependence include climate change, degradation of ecosystems & landscapes, poor air quality & health problems, resource conflicts, displacement of populations, rising sea levels, water shortages, insecurity of supply and inevitable rises in fuel costs. Recently, desperate efforts to extract ever more inaccessible fossil fuels(deep-water drilling, tar sands extraction, fracking, and drilling in the Arctic) have demonstrated the inherently damaging and unsustainable nature of our reliance on fossil fuels, and the need for alternative forms of energy. Carbon-lean: because over its lifetime each tree absorbs the same amount of carbon dioxide as it releases when burned. If sustainably sourced, trees are re-planted to replace those felled; therefore ensuring the same amount of carbon keeps being sequestrated in the forest, creating a closed-loop carbon cycle. It is only the small amounts of fossil fuel used in harvesting, hauling and processing that makes it carbon ‘lean’ rather than carbon neutral  . See the carbon emission comparison graph here – firewood and woodchip have a similar footprint as they require the same level of processing. Renewable: if woodlands are managed appropriately (e.g. trees planted at a similar/higher rate than they are harvested), wood is an abundant resource available locally on an indefinite basis. 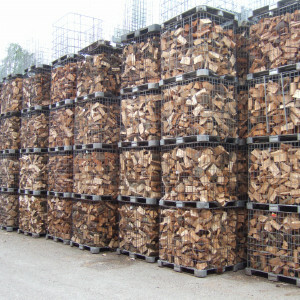 There is extensive capacity for woodland stocks to support a sustainable supply of woodfuel in the UK  . Clean: Sulphur Dioxide emissions (responsible for acid rain) from woodfuel boilers are much lower than from fossil fuels; emissions of other air pollutants such as harmful small particles (PM10 and PM2.5) and Nitrogen Dioxide (NO2) are lower than coal, equivalent to oil and only slightly higher than gas fired boilers  . Efficient: Modern biomass combustion systems are highly sophisticated, achieving up to 95% efficiency  . Beneficial to woodlands: Research by the Forestry Commission amongst others indicates that much of the UK’s woodland is under-managed or not managed at all. Contrary to popular belief, such woodlands are often less valuable in terms of tree health and overall biodiversity  . The use of woodfuel provides an economic incentive to manage existing woodlands and create new ones, improving habitats and biodiversity, reducing soil erosion andflood risk. Simple and non resource-intensive production process: sustainably managed woodlands require virtually no pesticides or fertilisers, and the harvesting and transformation process to woodchip or firewood is relatively low-tech, has a small footprint, and doesn’t require much external resources such as water, chemicals, etc. The main inputs are assets such as machinery, and the energy required to power them. Local economy: a thriving woodfuels market stimulates the local economy with jobs as diverse as woodland management, haulage, treework and retail. It also supports the rural economy and small scale local businesses. Global economy: unlike energy crops used for biodiesel production, wood requires virtually no toxic pesticides and fertilisers. It also doesn’t compete with food crops and therefore doesn’t impact the price of food on global markets. Affordability: woodfuels are a cheap alternative to fossil fuels. The expenditure of the initial combustion system is offset by the fuel affordability and government /products/rhi/. Security of supply: timber can be produced locally anywhere in the UK, contributing to the country’s security of supply and self reliance. Standardised products: international standards and accreditation schemes are in place to guarantee suitably high quality to provide trouble-free boiler operation. Forestry residues and arboricultural arisings not used for energy or some other application will usually rot. This will generate CO2 in any case, and may also produce methane (CH4), a greenhouse gas 23 times more potent that CO2. Some figures suggest that over 68% of this material is simply going to waste in the UK  . The TreeStation’s unique sourcing strategy converts these arisings into useful products, with an additional positive impact on climate change. Biomass is defined as “biological material derived from living, or recently living organisms”. As trees grow, carbon is absorbed from the atmosphere as carbon dioxide (CO2) by photosynthesis, using water, energy from the sun, and nutrients from the soil and incorporated into the wood material. Biomass fuels include virgin wood (such as the TreeStation woodchip and firewood), energy crops (methanol and biodiesel), agricultural residues, food waste, industrial waste and co-products. 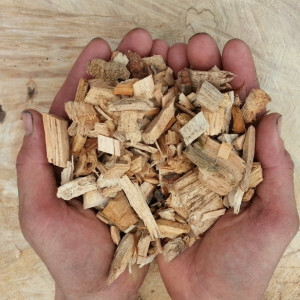 Woodchip can be used as a substitute for fossil fuels to provide heat, hot water and power (CHP); and woodchip boilers are available for all scales of operation, from 15kW domestic to multi-MW plants. Woodchip is a convenient form of woodfuel, allowing efficient storage and automated handling and feeding. It also has a large surface-area-to-volume ratio, allowing efficient combustion. The production process is simple and low energy, making woodchip both cheap and carbon-lean. Modern boilers are fully automated – controlling combustion parameters and fuel transfer – clean, and easy to operate. The installations require the fuel to be of stable and specified quality, to ensure optimum efficiency & uninterrupted operation. Can I trust the biomass chip technology? Wood chip is widely used across Europe, and has seen a sharp increase in the UK with the introduction of the RHI. It is a tried and tested technology, with accreditation schemes and international standards. The applications include homes, district heating, schools & universities, offices, hospitals, care homes, swimming pools, leisure centres and industrial processes, both for heating or Combined Heat and Power (CHP). Woodchip has all the environmental, social and economic benefits of using woodfuels, as described above. It is commonly agreed that despite a higher initial investment, biomass installations have a shorter payback period due to their relatively lower running costs compared to fossil fuel systems. The Renewable Heat Incentive further reduces the payback period, by providing a 12% return on the additional investment. This is because over its lifetime each tree absorbs the same amount of carbon dioxide as it releases when burned. It is only the small amounts of fossil fuel used in harvesting, hauling and processing that makes it carbon ‘lean’ rather than carbon-neutral. The illustration below shows a comparison of carbon emissions for various fuels, including the embedded carbon (i.e. released during the production). Source and assumptions in footnote . If you are considering a biomass boiler installation, please look at our new installations and RHI & financial support sections, and get in touch to discuss storage design in order to secure Whole Life Cost savings. (^) Data available from the Biomass Energy Centre website: “Carbon emissions of different fuels“. We can also offer contract chipping where a client has their own supply of feedstock. We have developed a unique sourcing strategy based on our ethical principles. This guarantees our woodchip is free from contamination and is as sustainable as it gets. Our chip is predominantly derived from timber which is not usable for sawn timber nor firewood but is otherwise of good quality for chip production. We use a mixture of hardwood and conifer species, and avoid excessive concentrations of Poplar, Willow, Western Red Cedar or Lawson’s Cypress. Some of these species produce more dust, have stringy bark, or have a higher chlorine content which in the long term can corrode the boiler. The wood arisings are segregated according to shape and size, stacked and covered. They air-dry for several months until they reach the appropriate moisture content and are ready for chipping. We only air-dry our wood, because the energy used in kilning the timber reduces the positive environmental impact of using wood. 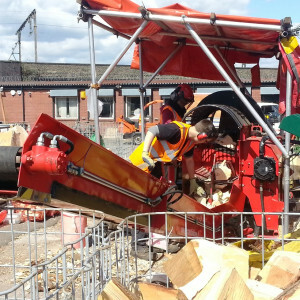 The TreeStation’s woodchip is produced using a well-maintained purpose-built biomass chipper. Our Heizohack 14-800K was designed by the German company Heizomat, whose core business is manufacturing biomass boilers. The changeable screen allows the production of different particle size. It is powered by a 220hp forestry tractor with roof-mounted crane, which is used to feed the chipper. Our chip is stored undercover for a short period of time only, directly in hook lift bins to avoid any contamination from being re-handled on the ground. We use quality testing as a mean of checking individual batches’ quality, recording an audit trail and for calculating the energy content and cost of each batch delivered. Our in-house testing capabilities and equipment form an integral part of our production process and its on-going fine-tuning. We also analyse the particle distribution on a regular basis. This factor is relatively stable, due to our screen-fitted chipper. Where required, we will also hold a duplicate sample for as long as it takes for the batch to be used, to allow retrospective analysis of chip characteristics if necessary. We take great care at every stage of our production process, to ensure the consistent high quality of our firewood and the safety of our staff. At the TreeStation we have developed a unique sourcing strategy based on our ethical principles. This guarantees our firewood is free from contamination and as sustainable as it gets. Our standard logs are made of a blend of high quality hardwoods, excluding Willow and Poplar. For specific requirements, such as softwood, we only use species with good burning properties, (e.g. Larch). Our kindling is made of softwood and Poplar. 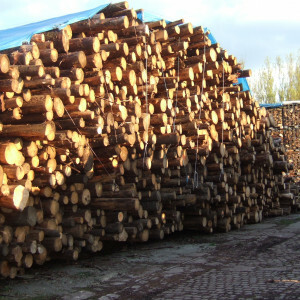 The wood arisings are segregated according to shape, size and species, and are then stacked to begin air drying. 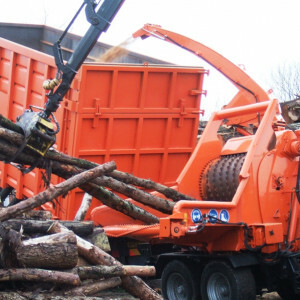 The timber is cut and split into logs by trained operators with a semi-automated firewood processor. Logs are stored in covered stacked cages – a system combining fast air-drying with space-efficiency. Once they reach the appropriate moisture content (less than 25%), logs are netted by hand and stored undercover. Kindling is produced in our specialised kindling machine from carefully selected and dried rings of timber. The kindling is netted by hand straight from the machine and stored undercover. We only air-dry our wood, because the embedded energy used in the kilns offsets the positive environmental impact of using wood. We use ongoing quality testing as a mean of checking our products quality and recording an audit trail. Our in-house testing capabilities and equipment form an integral part of our production process and its constant fine-tuning. We use visual assessment during hand bagging to check size, shape, and absence of contamination, and a portable digital moisture meter to check the moisture content. I’ve been ordering logs and kindling from TreeStation for a few years now. The quality and price are good, as are the eco credentials, so I keep coming back. What makes a big difference though is the helpful and friendly customer service from Hannah and her team. I’m a happy customer.